Could you please update flamehud? Best hud by far and still has not been updated. Thanks. nameCould you please update flamehud? Best hud by far and still has not been updated. Thanks. Yeah I thought Flame was going to update it shortly, but whatever, looks like quite some people is looking for it so I might update it untill Flame relases the official version! The find a game button works fine for me, I'm reworking that menu tho so just download the new verion when i post it (tomorrow maybe) and see if works. About the yahud and sdx 2013, you are right the casual menus are both broken :( I somehow forgot to update them. If you ever get time, can you update g0R3's HUDs? Feel free to redownload the huds for the changes. Thanks for the HUD updates! However, still nothing happens for me in Hudas Iscariote when I click 'Find a Game.' If it works for you, what could be the issue with me? bLaThanks for the HUD updates! However, still nothing happens for me in Hudas Iscariote when I click 'Find a Game.' If it works for you, what could be the issue with me? Quick question, are you using a customization (from the extras folder) ? Just gonna relase this straight away since I know quite some people wants it. Updated version in the first post!! Hypnotize bLaThanks for the HUD updates! However, still nothing happens for me in Hudas Iscariote when I click 'Find a Game.' If it works for you, what could be the issue with me? Yes, I used the redd0t killstreak meter (above health), 3D player class models, and labeled item meters. I'm using YaHud CMYK, and it has a few issues on my 4:3 stretched resolution. the scoreboard seems to be at the very bottom of my screen, only half of it is showing and there is an unnecessary pink triangle at the bottom right of my screen. Would be great if you could fix that. Thanks for the update! Again! ...But it happens that the new menus are still screwed up. 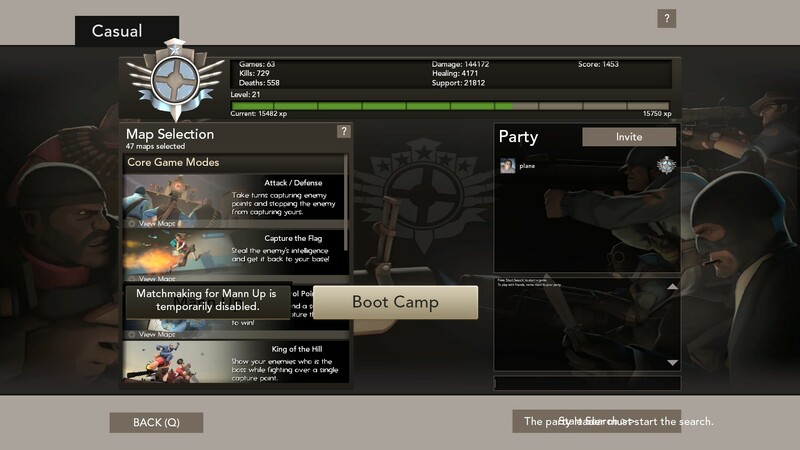 The MvM stuff pops-up on both the casual and competitive menus, and on its menu it's messed up. Thank you for all the efforts in updating old huds. I would like to point out that Casual player icons and healthbars are distorted in Flamehud. I'm using 1024x768, so that may be the case. bLa Yes, I used the redd0t killstreak meter (above health), 3D player class models, and labeled item meters. Oh alright, ye it's my fault I forgot to mantion that the customizations were outdated. But whatever now everything is updated if you re-download it. Zetos The new menus are still screwed up. The MvM stuff pops-up on both the casual and competitive menus, and on its menu it's messed up. Louis45vnI'm using YaHud CMYK, and it has a few issues on my 4:3 stretched resolution. the scoreboard seems to be at the very bottom of my screen, only half of it is showing and there is an unnecessary pink triangle at the bottom right of my screen. Would be great if you could fix that. Try to turn off the minmode if it's on. tnmThank you for all the efforts in updating old huds. I'm not sure I 100% understood what do you mean, can you take a screen of the problem please? [quote=tnm]Thank you for all the efforts in updating old huds. I remember when this thread was first made it had Thwartski Hud on it. Are you planning to update it as well? MaehemI remember when this thread was first made it had Thwartski Hud on it. Are you planning to update it as well? can you update wades hud?